A family man becomes a conspiracy-obsessed recluse after an encounter with a strange drifter leads to personal tragedy. "Buster's Mal Heart" is written and directed by Sarah Adina Smith, who has directed numerous short films, including a segment in the horror anthology "Holidays." 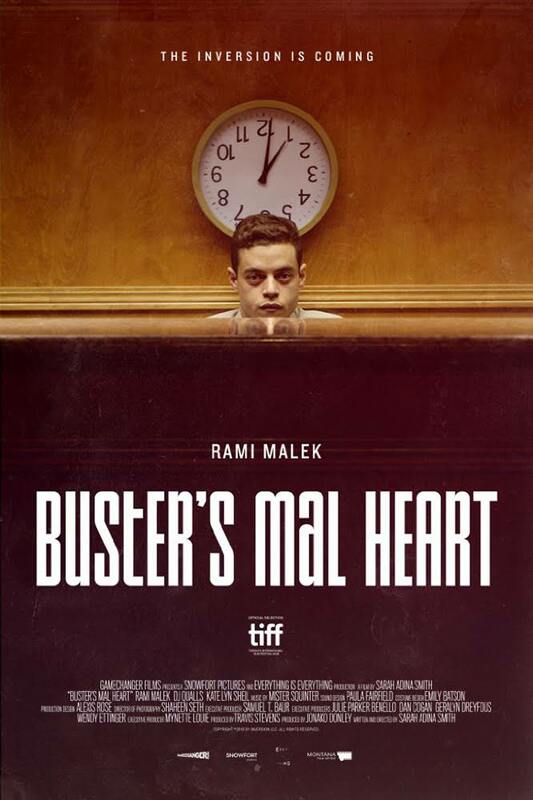 It stars Rami Malek as the titular Buster, though this isn't his real name. His real name is Jonah. Joining him are DJ Qualls, who plays a conspiracy-obsessed drifter, Kate Lyn Sheil as Jonah's wife Marty, and Sukha Bella Potter, who plays their young daughter Roxy. Jonah is a normal family man who has been forced to work the night shift at a somewhat crappy hotel just to make end's meet. It is Jonah's dream to own a piece of land where he and his family can be happy, keep to themselves, and be free from the shackles of his mindless, soulless job and all the stresses that come with it. It is at this very job where he happens to encounter a strange, sort of creepy nameless conspiracy-obsessed drifter and his life begins to change. Sleep deprived and worried about his future, his life, and his sanity, his boss Dale, played by Jared Larson, offers Jonah and his family a free hotel stay-cation to ease some of their burdens. An unfortunate tragedy befalls them, and over time, Jonah becomes obsessed with the very same conspiracy the nameless drifter droned on and on about, something known as 'the Great Inversion,' which has something to do with the upcoming Y2K event. "Buster's Mal Heart" is one of those movies where the timeline is presented in a non-linear fashion. It shows Jonah/Buster at three points in his life. The first point is when he is the aforementioned loving family man scraping every hour out of himself to provide for his wife and daughter; the second point is when he becomes a mountain man living off of the land and obsessed with the Great Inversion; and the third point is when he is stranded in the middle of the ocean on a dingy, dirty, starving, and alone. It is not always clear what is reality and what is delusion, what is the truth and what is made up in his mind. This movie feels like it's using a jumbled timeline to create some false sense of introspection. Director Sarah Adina Smith wants to have the twists, turns, and revelations be earth-shatteringly epic, but in truth, we see them all coming. It's as if she hangs the entirety of her story on the melding of multiple genres in an effort to have them all culminate in a jaw dropping Keyser Söze or Tyler Durden moment, which it never fully becomes. Rami Malek does put on a stellar performance as a man who displays quite literally what it would physically look like to have a broken heart. Malek gets to show a wide range of personality traits, which puts his excellent acting ability on full display. Unfortunately, a good performance isn't enough to prop up the other aspects of the film that fail him. Though mildly interesting, often bizarre, and at times heartbreaking, "Buster's Mal Heart" winds up being a poorly paced genre meld that often feels emotionally flat and is somewhat expected despite asking some interesting questions and showcasing some interesting concepts. Sign up for Amazon Prime Student and get FREE 2-Day Shipping!